I got on the phone with Amazon support and the battle began. 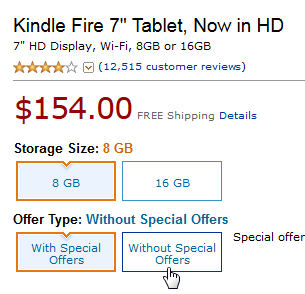 Sopwith(S): Hello – I just bought a Kindle Fire HD for my wife at Best Buy and discovered you are going to charge me $15 to disable the ads. I am requesting you turn off the ads immediately and I am not willing to pay for this. Operator(O): I am sorry sir – we cannot disable the ads without payment. S: I am not paying you to remove something I do not want and I did not know you have two different prices for the Kindle. O: That is why you should have bought the Kindle from us. 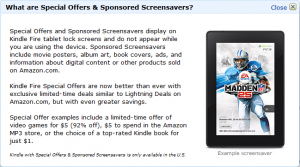 We clearly state on our web site the price of a Kindle is reduced if you accept the ads. S: Please look at my Amazon order history. I have spent thousands of dollars as a loyal Amazon customer. 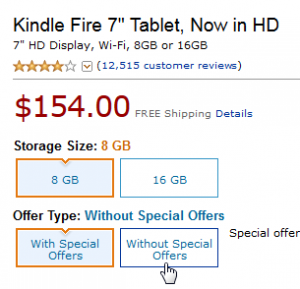 If you will not disable the ads without a fee, I will return the Kindle to Best Buy tomorrow and close my Amazon account. (Yup – I was pretty angry at this point). O: Sir – I will need a supervisor to approve this, please hold. Ultimately, Amazon agreed to disable the ads without a fee. They hit the magic button and told me to reboot the Kindle. When I did so, the entire personality of the device changed. Incredible resolution and no noise. Exactly what I thought I purchased. 1) Ol’ Sopwith has lost touch with the current state of communicating and should learn to deal with the changing landscape. 2) Most people who purchase the Kindle do not notice or take offense to the ads because they have capitulated to the reality that this is how the world works today (Complete surrender to the marketing machine). 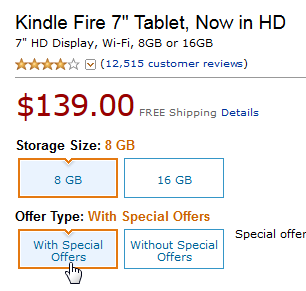 3) Amazon has gotten more aggressive in cost recovery because the margin on a Kindle is razor thin. I think Amazon went over the line with this and it has damaged our once excellent relationship. Mr. Bezos – this was a bad marketing decision and goes against the principals you publicly state are important to Amazon’s success. I would like your thoughts on this. This entry was posted in General by Sopwith. Bookmark the permalink.